The Mirabel Club, located in North Scottsdale, Arizona, this private golf community features a world-class Tom Fazio golf course, a member-owned golf club (limited to 350 members), elegant southwest style homes and custom homesites. At Mirabel, there is beauty as near and far as the eye can see. Situated on 713 acres of pristine desert land at an elevation of nearly 3,000 feet, Mirabel promises residents the beauty and pure air of the desert set against panoramic views of majestic mountains, like Pinnacle Peak, glowing sunsets and the sparkling lights of the valley. 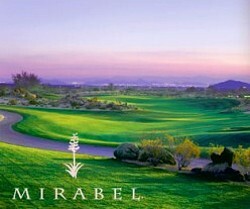 The Mirabel Club & Golf Membership is sold separate from property ownership and is located in North Scottsdale.